Christmas Fair and Cookery Demonstration. 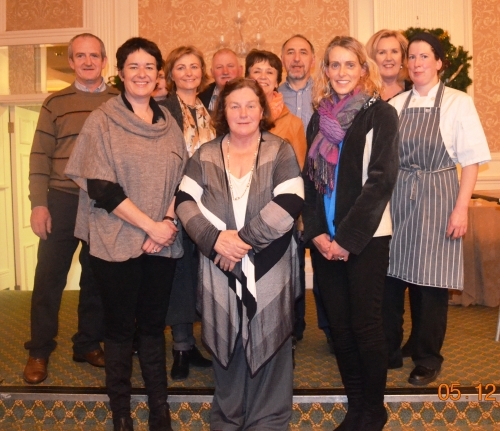 This festive fundraising event which took place in The Park Hotel last Thursday was a great success. Some delicious festive dishes were prepared by Eunice Power and later enjoyed by the audience. The night also showcased an array of seasonal products from Transition Year Mini Companies and some super prizes were won. Maurice Butler of “Butler’s Ice-Cream treated the gathering to a delicious selection of his Christmas flavoured ice-creams, which went down a real treat. Many thanks to Eunice for a most enjoyable and relaxed evening, thanks also to Róisín Lynch who assisted Eunice on the night. Many thanks to all our sponsors; “The Park Hotel”, Bríd O’Kennedy and Tom Dunford, David Walsh, Office and School Supplies, “Nemeton “T.V. Séamus Ó hAodha and Tomás Ó Riada, “The Wine Buff”, The Transition Year Mini-Companies and a special “míle buíochas” to the Parents’ Association who organised the event. Congratulations to Clodagh Mc Grath (Leaving Cert Class 2013) who was awarded an Entrance Scholarship to UCC on the basis of her outstanding Leaving Certificate results. We wish her every success in her studies and future career.Clodagh is pictured with the school Principal Ailbhe Ní Neachtain at the award ceremony in UCC. We would like to express our gratitude to John and Úna O'Riordan of The Shamrock Restaurant for their generosity in sponsoring a new set of GAA jerseys for the school. The AGM of the Parents’ Association took place on Thursday night. Ms Ailbhe Ní Neachtain (Principal) welcomed those present to the meeting. Ms Ní Neachtain thanked the members of the association for all their hard work over the year acknowledging the importance of parents and teachers working together for the benefit of the students and the school. Mr Peter Finch, member of the PA, presented a short review of the activities of the Parents' Association during the last school year which included the financial report. Supervised Study will be available from 9am to 4pm on Monday 30th December 2013 to Saturday 4th January 2014 in the College. Study will not be available on Wednesday 1st January 2014 - New Years Day. Cost €50, paid in advance. If interested, please contact the study co-ordinator Ms. Nollaig Sheehan. Booking forms are available from Ms. Nollaig Sheehan and the office. 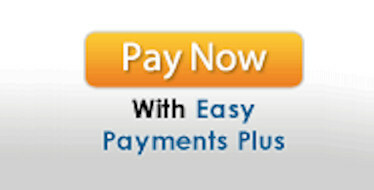 Completed booking forms and payment must be in by Friday 13th December 2013, if you wish to secure a place in study. Irish Science Teachers Association - Senior Science Quiz. The National Finals of this competition took place last Saturday in the Edmund Burke Theatre, Trinity College Dublin. The Friary was represented by two teams. Team 1-Niamh O'Gorman,Eleanor Slater and Ger Crowley. Team 2- Éinne Ó Cathasaigh, Osgar de Paor Kavanagh and Gemma Wyley. Team 1 finished in the top ten with 35 marks, the winning team scored 40 marks, a very close contest. Over 40 teams took part with Team 2 finishing half way. Great credit is due to these students as the standard was very high, not forgetting their teachers Ms Noreen Twohig and Ms Olive Fitzsimons. The 2013 School League tables for Leaving Certificate results and progression to third level colleges were published this week. 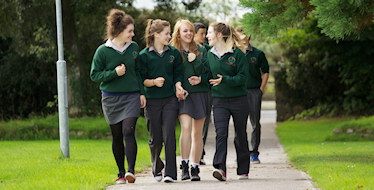 St. Augustine's College ranked as the top non-fee paying school in County Waterford. 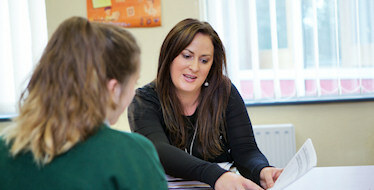 St. Augustine's College also featured in the top feeder schools in Munster. The continued dedication, hard word and commitment of our students and staff led to this outstanding ranking. Well done to all. Seven years after almost losing his life in a horrific car accident, Monivea man Shane Mullins is travelling the length and breadth of Ireland urging young people to mind their mental health. As a recently appointed media voice for the mental health charity " Headstrong", Shane has been speaking to secondary school pupils and youth club members, sharing his story and the struggle he has overcome to get his life back on track. Clodagh Mc Grath (Leaving Cert Class 2013) has been awarded an Entrance Scholarship to UCC on the basis of her outstanding Leaving Certificate results. 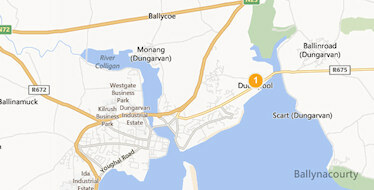 Congratulations to Clodagh on this marvellous achievement. We wish her every success in her studies and future career. 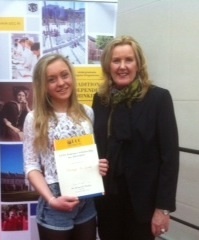 Clodagh is pictured with Ailbhe Ní Neachtain, Principal at the award ceremony in UCC.